Dean takes a tray of Winchester Surprise out of the oven. Mary: Winchester Surprise? I can’t believe you remember that. I can’t believe I ever fed that to you and John. It was so greasy, like a heart attack on a plate. Dean: A delicious heart attack on a plate, okay? I would like mine with extra cheese. 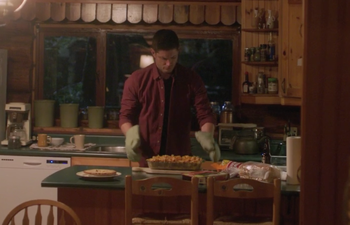 "Winchester Surprise" is a casserole that Mary used to serve for John and Dean before she died in 1983. It's also the only thing Mary knows how to cook. When Sam and Dean were younger, they attempted to remake the dish using bologna and sliced cheese. He comes back, he’s standing there, he’s soaking wet, and he’s pulling bologna and sliced cheese out of his pants. So, being the big brother, I’m the cook. I take all that baloney, all that sliced cheese, and I put it onto a hot plate. […] It stunk up that room so bad. Dad comes home, and he is so mad. He picks up everything, chucks it in the trash, probably reminded him of you, and… Anyway, it did not taste right. It didn’t taste like this. Dean and Mary eat Winchester Surprise. When Dean visits Mary at Donna's Cabin, he asks her to make Winchester Surprise for him. She is surprised that Dean remembers and regrets serving that to John and Dean. Despite it being described by both of them as a "heart attack on a plate," Dean asks for his with extra cheese. After Mary buys the ingredients at a nearby convenience store, she makes the casserole with Dean, who takes it out of the oven while Mary talks with Sam over the phone. At the dinner table, Dean tells Mary a story about how he and Sam futilely attempted to remake the Winchester Surprise after she died. 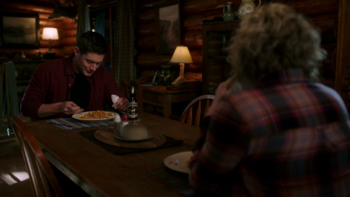 Dean also says that the three years he spent with her means a lot to him, especially since they're eating the real casserole instead of the bologna version. Mary makes Winchester Surprise for a family dinner after John was summoned from 2003 with the Baozhu. When everyone realizes that John has to be sent back to repair the timeline, it ruins their appetite for a time. At the dinner table, everyone picks at their food, but John motivates everyone to enjoy the time they have together. They enjoy their plates of Winchester Surprise and talk. This page was last edited on 15 February 2019, at 05:08.